Is it safe to fly in paragliding?, do the paragliders have any homologation? That is a question that many people ask me, Is it safe to fly in paragliding ? It’s a fact that the paragliding companies pay less insurance than a horse riding company. Paragliding has developed a lot since its beginning where it was an adventure to fly in paragliding, the first models were very complicated to fly and they had a hard time keeping their shape in the air. Flying in paragliding has become a safe activity thanks to the significant advance in the passive safety of paragliding equipment and in the continuous learning of the pilots. Do the paragliding equipment have any homologation? The DHV homologation consists of tests to which the paragliding equipment are subjected, they try to verify both their robustness of construction and their characteristics in flight. For this, the paraglider is initially subjected to structural or load tests, which try to determine the quality and reliability of its construction.The flying tests are performed by an expert pilot, who submits to the paraglider various critical maneuvers (asymmetric losses, bends, behavior in landing and takeoffs, losses, braking, braking, accelerator behavior, turns, etc.). ..) trying to reproduce the incidents that may occur . The way in which the paraglider reacts to them, and the greater or lesser intervention of the pilot to remove the wing from those abnormal flying configurations, makes the paraglider homologated within certain categories or levels. The paragliding equipment that we use in our tandem in Alicante are approved according to these standards and I can assure you that they are very safe, so much so that in more than 20 years of experience I have never seen any serious problem in this type of paragliders. But even so, we have a passive safety system, such as an emergency parachute (in case of a major problem in the air) and airbags for our harnesses (in case of slightly abrupt landings). Today we can have a very good approximation of meteorological conditions, which allows us to know how is the air mass in which we fly, and very important data such as speed and wind direction. Through curves of state, we can see how the wind and the thermal behave during the day, so we can have a good idea of what to expect on our flight. The wind is undoubtedly the first factor to take into account when deciding whether or not it is safe to fly in paragliding. To safely take off in paragliding there should not be more than 25km of wind in the takeoff, that guarantees us that our speed is positive, that is to say to advance against the wind. We must also pay attention to the direction of the wind, which should be indicated for home flight site, for example in Alicante we have several flight sites for specific wind directions, Palomaret in Agost it’s to south east, Santa Pola is a east wind site, and Benidorm is a south-east site. The gusts of wind due to the thermal activity is also to take into account, some bursts can increase the wind speed by up to 15 km per hour. 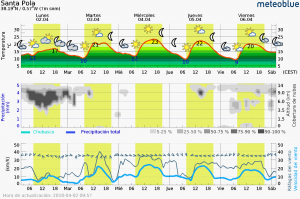 Fortunately, modern weather forecasts can give us these parameters with accuracy. We can also say that we can fly with zero wind, we just have to run to reach the flight speed of our paragliders and thus sustain the necessary lift for the flight. They are undoubtedly one of the factors that must be taken into account for safety the paragliding flight. In general terms we should not fly when there are possibilities of storm. Storms usually bring associated strong turbulence due to the high wind speeds generated by rain and updrafts of air, often originating micro frontal systems of cold and warm air masses. Many people ask me, can paragliders fly in the rain? Flying under the rain is not pleasant, the lack of visibility along with the possible winds associated with it make flying in rain inadvisable. Should paragliding pilots have license? The answer is yes, to fly paragliding commercially in Spain the pilots must opt for a valid national sports technician license. This ensures that paragliding pilots on commercial flights have sufficient skills for safe practice. 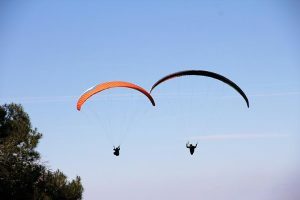 During the course of paragliding sports technician, the pilot trains in different areas (paragliding techniques, aerology, meteorology, first aid, psychology and legislation) as well as an important number of supervised practice hours that the pilot must perform. But it is undoubtedly the experience that makes the difference in the level of piloting of paragliding pilots, some skills can only be achieved after years of practice. Paragliding is one of those activities where one can put the degree of difficult depending on the type of flight you want to perform, so the pilot can fly from the placid glides in the morning to the most turbulent hours of midday. Every day is different in paragliding, that is what makes this discipline so marvelous, every day are different and pose different challenges. But what I think is more important for the practice of tandem paragliding is the common sense, it is the pilot through his experience and good judgment that really makes this discipline very safe. I hope these words clarify you about safety in paragliding and encourage you either in just solo paragliding or with us in Tandem paragliding, whatever your discipline is, visiting the sky is always a wonderful and unique experience. Previous postParagliding, Skydiving, Air Balloon whats the difference? Nice post. I was checking continuously this blog and I am impressed! Extremely helpful information specially the last part :) I care for such information a lot. I was seeking this certain information for a very long time. Thank you and good luck.